For 2013, the Subaru Legacy sees a newly styled front-end, a more powerful and efficient four-cylinder engine, revised suspension tuning, an improved continuously variable transmission (CVT), and a new collision avoidance system is available. Base models now feature Bluetooth and the 2.5GT and 3.6R premium trim levels have been discontinued. 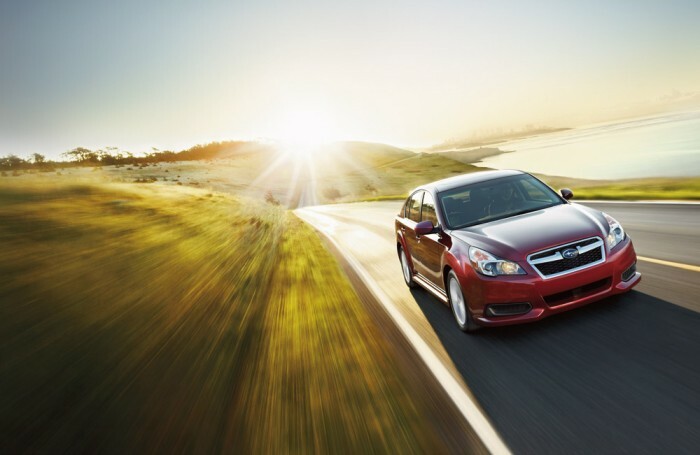 The Legacy features a clean, elegant design – a departure from Subaru’s otherwise rugged image. Soft lines, sloping curves, and a bold front façade help this Subaru to stand out in the crowd. The Base 2.5i model comes with 16-inch steel wheels and automatic headlights, while the 2.5i Premium model adds 17-inch alloy wheels and body-color outside mirrors. The 2.5i Sport takes things up a notch with 18-inch alloy wheels, fog lights, and a sunroof. The all-wheel-drive Legacy is offered with two different engines – the base 2.5-liter horizontally opposed “boxed” four-cylinder engine creates 173 hp and 174 lb-ft of torque, while the upgraded 3.6-liter “boxed” six-cylinder offers 256 hp and 247 lb-ft of torque. As with most Subaru’s, standard all-wheel drive is a major selling-point – but has also meant less-than-stellar fuel economy – until now. This year, Subaru has introduced a more efficient four-cylinder engine, and when combined with Subaru’s second generation CVT, the Legacy can compete with the Honda Accord and Toyota Camry when it comes to fuel consumption. A six-speed manual transmission comes standard in the base 2.5i model, with the optional CVT. The CVT is standard on the Premium and Limited models, and Subaru estimates that 2.5i models with the CVT will get 24 mpg city, 32 mpg highway, and 27 mpg combined – a definite improvement in fuel economy from last year. The 3.6-liter is estimated to get 18 mpg city, 25 mpg highway, and 20 mpg combined. The Legacy has a sleek interior with quality materials that create a high-end feel. The dash has a modern, straight forward design and controls are well-placed and easy to navigate. Space is plentiful in both the front and back, making it possible to comfortably transport four adults. Stay connected with Bluetooth phone and audio connectivity, a four-speaker sound system with a CD player, an iPod/USB audio interface, and an auxiliary audio jack – standard in every Legacy. An available touchscreen navigation system is intuitive and responsive. The Legacy comes standard with antilock disc brakes, stability and traction control, front side airbags and side curtain airbags. The Limited trim level offers an optional EyeSight system, which uses two cameras mounted in the upper edge of the windshield to provide adaptive cruise control, pre-collision braking, lane departure warning and sway warning. The 2013 Legacy received the Insurance Institute for Highway Safety’s highest Top Safety Pick+ title after earning the best possible rating of “Good” in their testing. Related: When Does A Car Become A Classic?